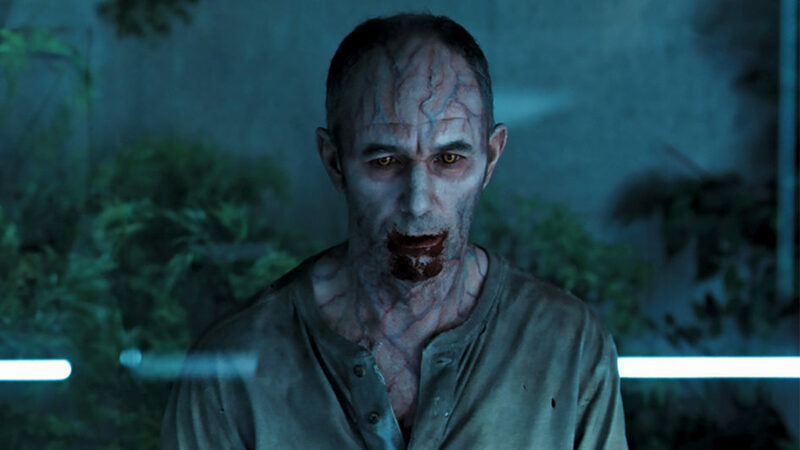 The Passage‘s pilot felt like a medical drama disguised as a thriller with horror elements. Sure, there’s a 10-year-old girl — Saniyya Sidney’s epic performance as Amy Bellafonte — chosen as humanity’s only hope to fight an oncoming global pandemic at the end of the world, but none of that would matter if the audience wasn’t emotionally connected to the show’s main characters. Adapted from the best-selling novel of the same name by author Justin Cronin, serious comparisons have been made to Stephen King’s The Stand. Sounds like this new series might already be on the right track. A new drug has been developed that makes people immune from ALL types of infectious diseases… although each of the first 12 test subjects have developed a serious blood thirst as a side effect. The show — as well as the characters — go out of their way to NOT call them vampires, but that’s what the test subjects for this drug trial have effectively become. For now, many of these man-made monsters are imprisoned… but for how long will they remain? Science is a loose term that’s used in the first episode and it’s never fully explained why Amy Bellafonte’s young character is chosen as the planet’s savior, other than she has no family to interfere with the medical test and that youngsters have more neurons than adults. For an hour-long episode, that’s all the details the viewer gets for one episode. A fan of A Wrinkle in Time, Amy’s foul-mouthed character is too smart for her own good, although she’s made a connection with her Collector, Brad Wolgast (played by Mark-Paul Gosselaar), who’s gone rogue after connecting emotionally with Amy, while channeling the loss of his young daughter. Sidney is a tough and great actress, who made me shed a tear when talking about her character’s recently deceased mother. Gosselaar takes on a protector role instead of simply doing as he’s asked, showing more emotions than smarts that will most likely cause a problem at some point in his character’s near future. Project Noah seems to have created a new species of monsters that will most likely escape into the world, creating an Apocalypse and possibly needing a last hope for humanity’s survival. While the magical 250-year-old man who made a cameo as Patient Zero really didn’t get much of a backstory, hopefully this top-secret government agency didn’t just let him escape into the wild jungles of the Bolivian Highlands, as briefly shown in the cold intro. He could definitely provide some answers for our heroes. Death seems inevitable for each person who participates in this drug trial, so it’ll be interesting to learn more about the other side effects that are experienced by the user, including the ability to mentally project nightmares into the minds of others. Having not read any of the source material’s book trilogy, I’m excited that vampires have finally returned to the spotlight that aren’t lovelorn teenagers. These are relentless, bloodthirsty monsters who will hopefully be on a neverending mission to create an undead Apocalypse. Now that would be a great conclusion to Season 1, should the show even last that long… and actually explain more of the finer details of the virus (and its cure).